I swim, I bike and I run. Not always in that order and sometimes not very well. 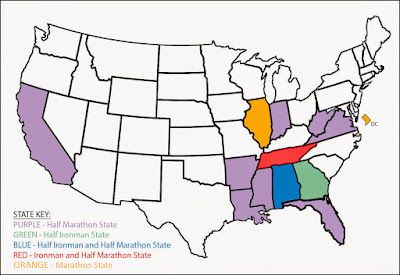 Most people know I have a long-term goal to run a half marathon (or further) in every state. 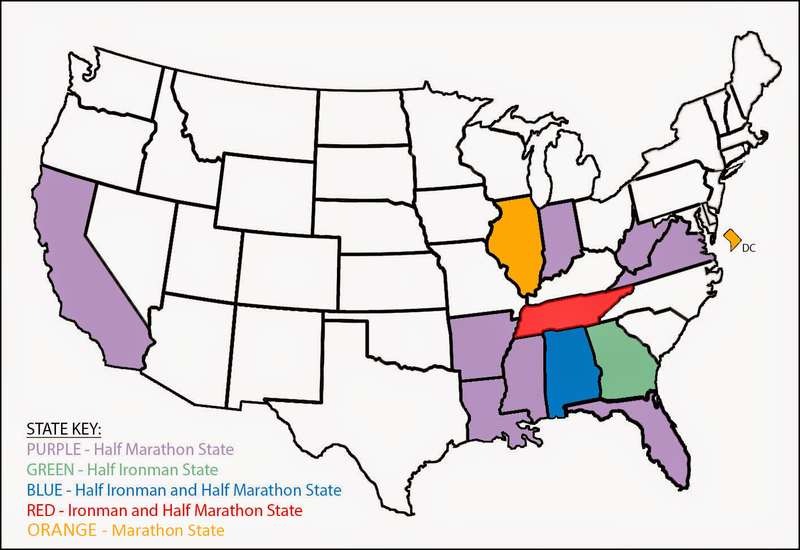 While I didn't add that many states this year, I did add two: Mississippi and Illinois. I've pretty much hit all of the states within reasonable driving distance, so they're getting harder to cross off my list now. However, I think I'll be able to get three or four more in next year - most likely including Ohio, Kentucky and North Carolina. We'll see. Overall, I guess I did OK with my goals this year. Honestly though, this year has sucked so bad that I'm surprised I accomplished anything at all. I don't think I have ever had a year as stressful as 2015. My father was diagnosed with cancer, my mother had a heart attack (they're both OK now) and we lost our beloved dachshund to cancer all within a few months. It was terrible and I'm ready for 2015 to be over and get a fresh start in 2016. Speaking of 2016. I haven't set any Big Hairy, Scary Goals yet. I'm going to - I need figure out my work schedule first. I'm toying with a few Half Ironmans and Half Marathons - probably no fulls in my 2016, but you never know. ;-) I might get a wild hair and sign up for something. I'm sure I'll come up with a few non-fitness related goals, as well. Gotta keep things in balance, you know? I hope everyone has a wonderful New Year's and a blessed 2016! 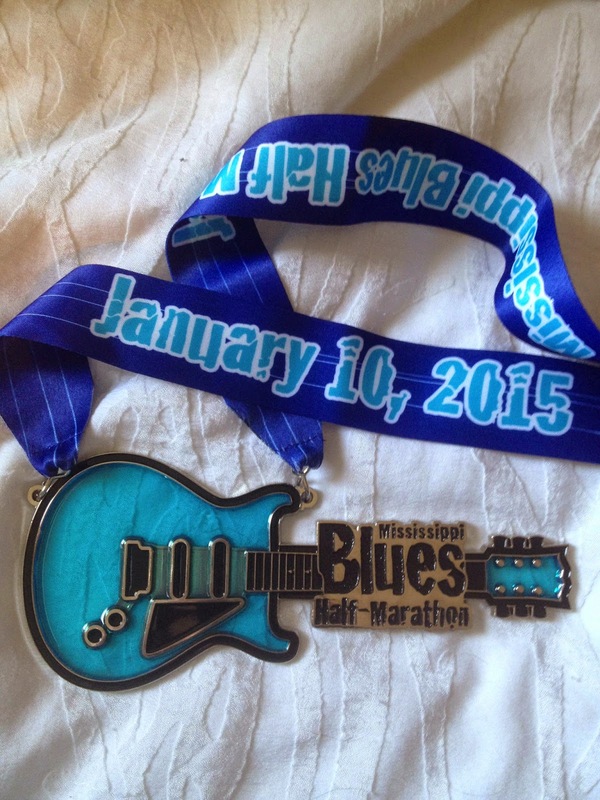 The Mississippi Blues race is known for their unique medals, which makes it popular on the 50-state running tour. I think the medals all have a guitar theme, but they're different every year. I really liked this year's. It was pretty heavy too. Made you feel like you accomplished something when you got this thing. Yeah...so I didn't actually do this race. In fact- no one did. It was cancelled due to unsafe conditions on the trail (flooding), so everyone did the 5k and received the half-marathon medals. Wasn't going to post it, but thought someone might be interested in seeing what the medals looked like since it's a popular local race. I think it's the same every year, but with a different colored ribbon. The same design is on the shirt. 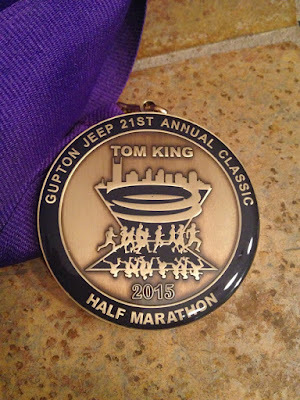 Not my favorite medal of the year, but it's not bad. I guess that it's just a little generic. I actually think what bugs me the most about it is that there isn't a date or even a year on it. When I'm old and senile, I'll have no idea when I did this race. And let's be honest, that could be as soon as next year. 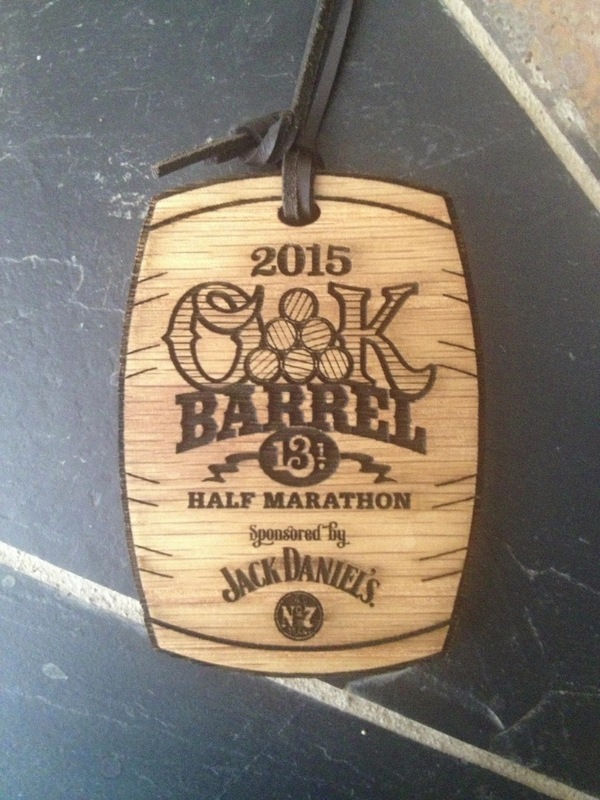 As always, Oak Barrel has one of the coolest medals of the year. Nuff said. 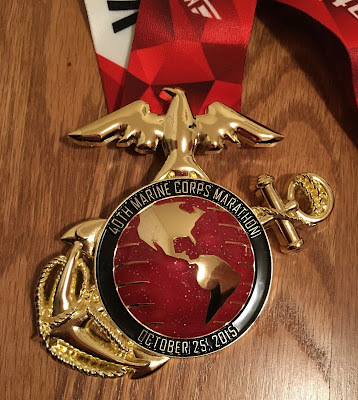 The Ironman organization usually has good medals, and this one was no exception. I kind of wish they would move away from the Choo Choo theme though. 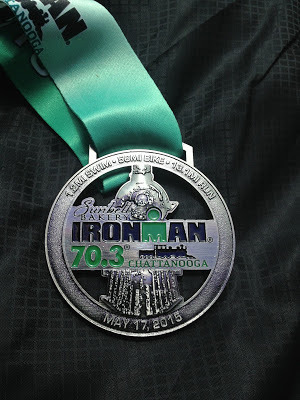 My Ironman medal from last year had at train theme, as well as the same color scheme. It would have been nice if IM changed it up a bit between the races. Mach Tenn doesn't give out medals, but this is my age group award. Yes, I'm posting this here because I actually won my age group and I still can't believe it. 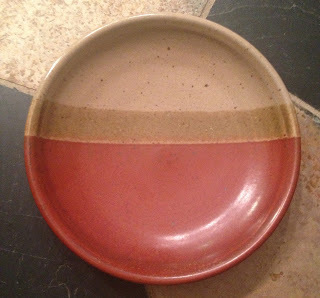 Plus, I like the plate. 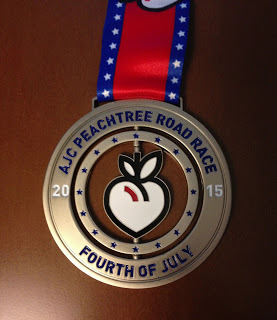 The Peachtree Road Race doesn't have a medal that is given at the end of the race - you have to buy it. Kind of surprising considering how big the race is (it's the largest 10K in the world), but it was just a 10K. Most 10K races I've done don't give out medals. But I bought one (you order them when your register) because I like medals and I doubt I'll be doing this race again so it's a nice momento. I dig it. It's very patriotic, as the race was on the 4th of July, and the middle parts rotate. 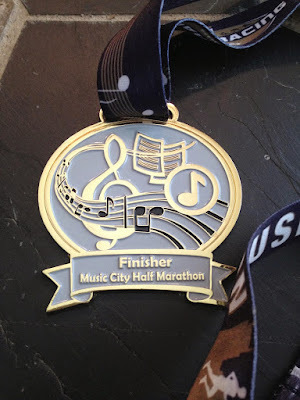 Here it is - my first marathon medal. It's not as blingy as I would have liked, but it's not bad. 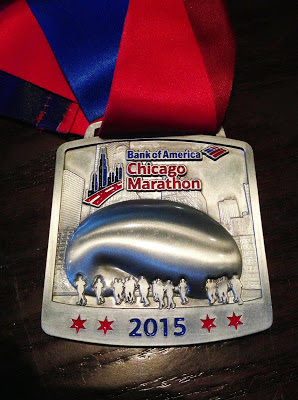 A silver medal that features a giant silver bean just has a lot of silver on it. I probably would have picked a different landmark had I been designing the medal, but that's just me. I just kept thinking of the people who didn't know what The Bean was. They probably looked at the medal and wondered why there was a giant blob on their medal. Plus, I thought it was a little small for a marathon medal, however since it was my first marathon - I love it. Now THAT'S what I'm talking about. That's a medal with flair. I love this medal. It's pretty big and has a lot going on. Probably my favorite medal of the year. OORAH! Hope you enjoyed my recap! Looking forward to a great year of racing in 2016! As a calendar year ends, I frequently find myself frantically reading short or fluff books in order to meet my Reading Challenge of 52 books in a year. This year is no exception. I have two weeks left in the year, and am currently reading my 49th book of the year. While I should make my deadline, my books over the past month haven't exactly been great literature. However, that doesn't mean they're not enjoyable, as this month's selection was. In fact, I enjoyed it a lot more than I thought I would, so let me tell you a little bit about "Sh*t My Dad Says" by Justin Halpern. I first heard about "Sh*t My Dad Says" a few years ago when it was just a Twitter feed - a very popular Twitter feed, but the books and TV show hadn't been released yet. The backstory of the author and the book is this: a 28 year-old guy (Justin) gets dumped by his girlfriend and has no place to live so he moves in with his parents. His dad (Sam) makes hysterical, and usually inappropriate, comments and the guy starts tweeting about it. So many people follow him on Twitter that publishers come calling and the result was "Sh*t My Dad Says." I was presently surprised at how much I enjoyed this book. I actually audibly laughed a few times, and I'm not that kind of reader. Sure, I'll cry at the drop of a hat when reading, but not laugh (which probably is some crazy insight into my personality, but I'm not pursuing that now). Each chapter was an antidote from Halpern's childhood that was followed by 5-10 quotes from his dad. Sometimes the stories were funny, sometimes they were poignant. Sometimes I really felt sorry for Halpern because, damn, his dad could be brutally honest. But the book works because his dad was never purposely cruel - it's obvious how much Sam loves his son. He was just telling the truth as he saw it and he wanted Justin to do the right thing. Example: one time Justin faked the results of his science fair project and his dad (a scientist) made him publicly apologize to his teacher and to the class for being a disgrace to science. Unfortunately, now a days that parent might be thrown in jail for the public humiliation of their child, but to me that's just good parenting. 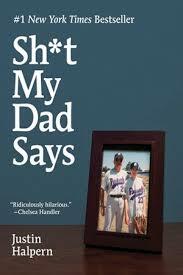 So, if you're looking for an easy, funny book to get you through the dark Winter months, check out "Sh*t My Dad Says." It's worth the read. Almost two weeks ago, our dog Buck got sick. This story has a happy ending, so don't worry about finishing this post, but it's a weird illness that I had never heard of before and I wanted to spread the word about it. What happened was Buck got up to get a drink of water and almost immediately puked up all of his dinner. And then while we were cleaning that up - he got sick again. Everything else seemed normal at this time, but we decided we were going to take him to the vet in the morning to get him checked out. When we got up in the morning, Buck wouldn't eat and his mobility had diminished. He wasn't moving much, but when he did move, he was kind of stumbling. He also looked weird. His eyes were kind of darting and his head was a little tilted. I actually asked Dudley if maybe Buck had a stroke. It was pretty scary. Dudley took Buck to the vet and it turned out he had Vestibular Disease. It's kind of a doggie vertigo that is caused by an irritation to the nerves that connect the inner ear to the brain. It can be caused by an ear infection, or even a brain tumor. However, sometimes it just happens - especially in older dogs. Dudley was told that it should be very treatable, was given some medicine and took Buck home. In theory, he'd be pretty bad for about 72 hours, but then things would start turning around. By that afternoon, Buck was worse. He was incredibly dizzy, which made him nauseated and unable to function as usual. He wouldn't eat anything, could barely walk and had to be carried outside to go potty. And he wouldn't straighten out his head. He kept it tilted to the side no matter what he was looking at. For the first 72 hours, Buck pretty much slept the entire time. We kept his room really dark and quiet and we tried to not disturb him too much. He would drink water, but had no interest in food at all. Unfortunately, when ever he drank too much, he would get sick so we had to limit how much he drank whenever he visited the water bowl. By Sunday (96 hours after onset), he had a little more energy and was walking a little better (he started trying to follow Dudley around the house again - Buck LOVES Dudley), but that was it. We were especially concerned because he still wouldn't eat anything - not ground beef, not plain chicken, not rice - NOTHING. This, of course, freaked us out because Hef stopped eating when he was sick, and he ended up having cancer. So on Monday, I called our vet to let him know that Buck still wasn't eating. After scaring the bejeezes out of me by mentioning the possibility of a brain tumor, he recommended a prescription food that we should try - Hills A/D. We were a little scared to give it to Buck because if he didn't eat it, then he probably DID have a tumor. But, Thank God, he loved it and ate that stinky food right up (seriously, it reeked!). Bless his heart - he was probably starving but nothing smelled good until we got that. I'm writing about this because I know most of my friends have dogs and this could happen to any of them. It was really scary to watch Buck go through this at the beginning, and honestly, it looked like something that was terminal at first. I read that some people believe that their dogs have had a stroke and have them put down. So, if your elderly dog suddenly starts showing signs of dizziness and loss of balance, or his head starts tilting and he gets sick - don't immediately panic. It might be vestibular disease. OK, would someone please tell me what is going on here? I had an easy three-mile run on the schedule last night and decided to do a quick buzz around the neighborhood. Though I've only lived in this neighborhood for a little over a year, I've run this route many, many, many times in varying weather. I'm very familiar with it. It was about 50 degrees when I left my house with a cool breeze. Good running weather. But after I ran about a half-mile, the temperature changed by about 20 degrees for 5 seconds. It like a blast of warm air enveloped my body. You know when you're swimming in open water and you swim into an area that is significantly warmer than where you just were, and then you start to wonder what just peed there? It was like that. Well, except for the peeing part - because it was the air and I don't even want to think about running through vaporized pee. Anyway, as I stated, the sensation didn't last very long, really just a few steps, and then it went back to 50 degrees again. "Well, that was weird," I thought and continued with my run. Then it happened again about a quarter-mile away. And then again. By this time, I've started looking around trying to figure out what's going on, but I really can't find a cause. As I said, I'm very familiar with this route, and this has never happened before. The houses are all on one-acre lots and none of them are close enough to the road to cause the temperature change. I wasn't running over any man-holes or grates at the time - just regular old asphalt. And it was dark out, so it's not like I was running in and out of sunshine. This happened a total of five times during my three-mile run, both out and back, but on different places in the route. Can someone please tell me what happened here? Some sort of weather phenomenon? Aliens trying to beam me up to their spaceship (but I was too fast, obviously...)? At one point I toyed with the idea that I was running through ghosts who were trying to warn me about some evil that lurked ahead. You think of weird things while you're running. Of course, I made it home safely, so there goes that theory. Oh - and I bailed on the 12S Winter Warmup on Saturday, in case anyone was wondering. After coughing all night and only getting two hours sleep, I figured it wasn't a very good idea. Stupid cold. OK - this isn't so much of a race report, as the Riverside Screw isn't exactly a race. It's more of a race / fun run hybrid where everyone gets a prize. And it's awesome. 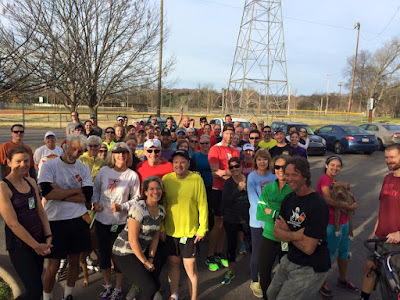 This was the 2nd Annual Riverside Screw and it took place on Thanksgiving (we missed last year's race because we were in DC). It was created by fellow East Nasty Zach as an alternative to other Thanksgiving Day runs because East Nashvillians REALLY don't like to leave their 'hood. Well, it could also be for other reasons, but I thinking that's the main one. The basic idea for the Screw was this - meet at Shelby Park, run down Riverside Drive for 2.5 miles, turn-around and come back. While this could have been the end of the planning, Zach had other things in mind. What's a race without bib numbers, right? Since the race was free, and bib numbers cost money, we all got Uno cards as bib numbers. Also, when you checked in, you received a number for a drawing at the end of the race. Fun! We met up around 8:00 am, and started running soon after. The first thing we hit on this course was "The Nasty," which is one of the worst hills in Nashville. I didn't even try to run up the thing. I ran and chatted for about two miles (I only had four miles on the schedule) then turned around back to the park. Dudley was there too, but he had our foster Big Henry, so he just walked a bit. Big H isn't much of a runner. He's more of a loper. When we all returned, the lottery began. Zach had his car full of t-shirts, socks and other random items people had donated to the Screw. Some of the items were legit prizes - shirts, running belts, a Nashville Running Company beer growler...while others? Not so much. My friend Ashley won a baggie full of dental floss and another person one cocktail napkins from one of Zach's weddings. I won a CD case and a pair of Injinji toe socks that I'm pretty sure were previously used as sample socks at NRC. It was hysterical and a lot of fun seeing what everyone won. The Riverside Screw is definitely going to be our new Thanksgiving Day tradition. Thanks Zach, for a great run! I pretty much ate the rest of Thanksgiving weekend (I mean, who doesn't? ), and was all ready to hit December head-on fitness-wise. I had my diet ready, and my workouts scheduled. I was set. And then I woke up on December 1st with a sore throat. I was so annoyed. I pushed through for a few days, but admitted to myself yesterday that I need to take a few days to get better. I cancelled last night's swim and will do the same for today's run. I'm supposed to run the 12 South Winter Warmup 12k tomorrow. We'll see how that goes. I don't have great hopes for it. A Christmas Story 5k/10k Virtual Run - Who's In?